It’s officially Jamaica Food & Drink Festival (JFDF) season! On Friday, October 5 the JFDF in conjunction with Select Brands hosted an intro to wine and food-pairing at Broken Plate. Festival project manager Nasma Chin welcomed guests to the first in a series of JFDF seminars. She was quick to highlight the festival’s partnership with the University of Technology, Jamaica (UTech, Ja) that will see “students attending every seminar and working alongside chefs during the festival”. Chin mentioned the festival’s investment in youth and was clear that the JFDF is “not a four-year project but a 25-year one”. Select Brands trade development manager Debra Taylor then led the almost two dozen attendees through the basic anatomy of wines, the steps for tasting wine and an experiment to test how well wines pair with certain flavour profiles. 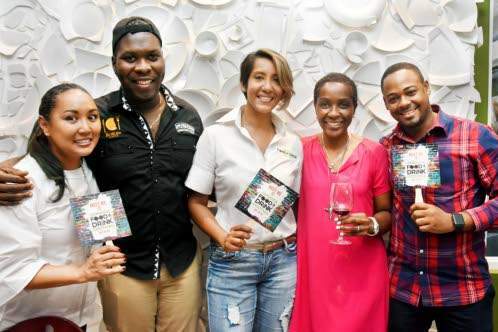 The event casually dubbed “food, wine and Friday” saw the group, comprised of chefs, caterers, marketing professionals and hospitality students, transfixed as Taylor shared tips on improving wine knowledge. Taylor is an excellent teacher. In discussing varietals (“the name of the principal grape variety from which a wine is produced eg, Cabernet Sauvignon, Chardonnay and Merlot”), she used a mango analogy to ground a topic, foreign to some, to something local. “If blindfolded most of us can tell the difference between a Julie, an East Indian and a Bombay, so it is with varietals,” she said. Over time and with lots of exposure wine drinkers can easily identify the kind of wine they are drinking. Taylor was great in breaking down wine lingo for the group. In describing the mouthfeel of light, medium and heavy-bodied wines she told the group to imagine the differences amongst skim milk, whole milk and half-and-half. A few light bulbs went off and a number of guests nodded in understanding. Taylor then led the group through the five-S system for wine tasting — see, swirl, smell, sip and swallow (or spit if there are spittoons at the ready). Guests had fun with this but had even more when they got to do a little chemistry. Before guests were plates containing salt, sugar, wedges of lime and hot pepper sauce. The activity: taste each of the elements with each of four wines to see what pairs well. Some pairing were revelatory, others made guests wish that there were indeed spittoons. This, however, was just the precursor for the afternoon’s real wine and food pairing. Broken Plate chef Damion Stewart created five small bites that paired well with four specially chosen wines. Thursday Food should note that the four wines paired with the salt, sugar, lime, pepper experiment (Hardy’s Chardonnay, Hardy’s Moscato, Hardy’s Merlot and Primal Roots red blend) were different than the ones Taylor paired with Stewart’s assortment of savoury bites. To go with the Mud House Sauvignon Blanc, Kung Fu Girl Riesling, Ruffino Moscato D’Asti and Simi Cabernet Sauvignon the Broken Plate chefs paired shrimp flatbread, duck breast bruschetta, pork chops in a sticky Asian sauce and rack of lamb with sweet potato croquette, respectively. Of course, the pairing worked well and the guests enjoyed further experimentation with the food and wine options. The introduction to wine and food-pairing event was good and despite the level of wine knowledge, there was something that even the most seasoned oenophile could take away. Even if it was Taylor’s closing statement: “There’s a wine for everybody, every taste and every time of day”.